Personal account access is restricted to project's partners. HomeBlogCruise 2013Here we go again! 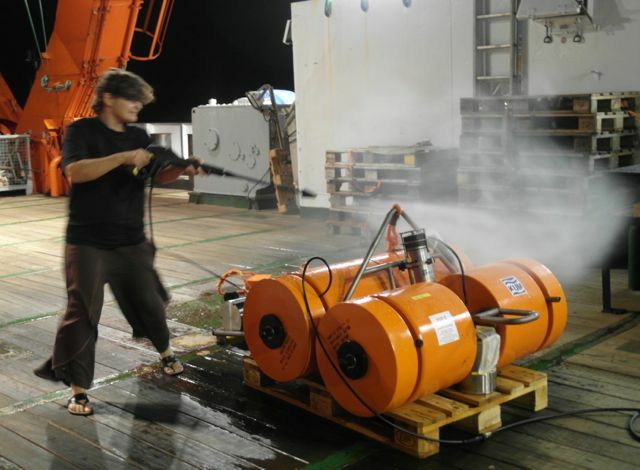 OBS technician Edith is kärcher-ing seismometer RR12 with freshwater just minutes after it has been pulled on board. The narrow titanium cylinder that sticks out between the orange buoys is the release unit, which attached the assemblage to, and later detached it from, its heavy steel anchor. The anchor stays behind on the seafloor. The wide titanium tube that rests on the wooden pallet is the seismometer itself. The data logger and lithium batteries are contained in two horizontal titanium tubes on the opposite side of the buoys (barely visible in the photo). The orange rope contains a few loops by which the sailors fish up the OBS with their long hooks once it has resurfaced. The German part of RHUM-RUM is led by Karin Sigloch, Department of Earth Sciences, Ludwig-Maximilians-Universität, Munich, Germany. "The Sun, the Sun, from the Meteor"